Winners of NN Social Innovation Award at JA Europe Enterprise Challenge 2016 tell us their JA Story. We are four Danish students from business Academy Aarhus, Denmark. We are about to complete our bachelor’s degree in innovation and entrepreneurship. 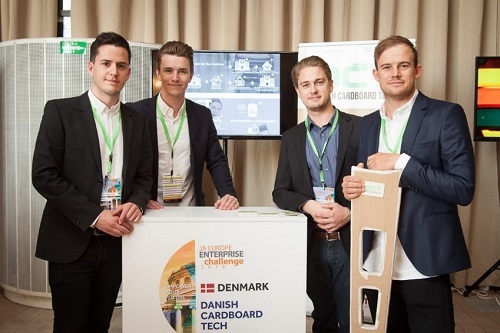 Together we form the company called, Danish Care Tech ApS that develops medical equipment in sustainable material. Our goal is to improve the exploration of the world’s resources and make medical equipment more affordable to people all over the world. We participated in JA Europe Enterprise Challenge 2016 in Bucharest where we won the, social innovation award. We learned a lot about our business concept and how we can strengthen it in the future. We achieved competencies in presentation and negotiation. Many times, it's about explaining about your business as short as possible. We quickly learned that it was a necessity. It was very rewarding in terms of our self-awareness. Throughout this three-day competiton, we had the opportunity to interact with the mentors several times. This was the first time we received direct questions about our business concept and plan from competent people. They were very relevant and concise questionnaires, which made us stronger and more knowledgeable about our business. This knowledge has been very useful afterwards in our business practice. In the subsequent process, NN Group put us in contact with relevant professionals from their network that could help us further in relation to production and development of our product. The knowledge we have gained from these contacts has contributed with a lot of insight into production opportunities. We have used this insight much afterwards. The experience has clearly strengthened us in terms of feeling entrepreneurial. When you work as an entrepreneur, it is often about building a business concept from the bottom. It is about being good at presenting your concept and being aware of what people like investors or partners would like to know. This has the experience definitely helped us hereby. At the moment, we are focusing a lot on implementing our knowledge of sustainable development to other product in terms of medical equipment. We frequently experience great interest for green improvements. This is why we are continuing to develop several products. We would definitely recommend the program to others. It is a very rewarding way to gain insight into your own business. The mentors and the program can really challenge you and ask some constructive questions that you have to know about.